Today Ireland can boast to having one quarter of a million hectares of conserved peatlands in Europe. Before the 1980’s there was very little thought of peatland conservation in Ireland. This changed with the help of the Dutch nation and the Dutch-Irish Bog Conservation campaign to save bogs in Ireland. Since 1983, IPCC have been working with Dutch peatland conservationists to purchase peatlands in Ireland, develop education materials and organise exhibitions highlighting our work together. Make an inventory of all the remaining peatlands. Stop drainage and restore the peatland hydrology. Draw up management plans for the peatland reserves. Provide public relations materials and information about the Dutch peatland conservation plan. This five step plan resulted in the Dutch Government acquiring the last remaining 8,000ha of peatlands and to date they have spent almost €100 million on peatland restoration projects in The Netherlands. The Bargerveen Bog in the north east of the Netherlands is one of the last bogs remaining. Watch our video about this cultural landscape. They also opened the Veen (Peat) Museum in the East of the country to educate people about peatlands. Just like The Netherlands, turf was cut by hand for many years in Ireland. The hand cutting of turf was very slow and as a result very little exploitation occurred on the peatlands of Ireland. However in the mid 1940’s Ireland began to commercially develop its peatlands. This continued unchecked until the Dutch peatland scientists arrived here. In 1978 Matthijs Schouten (left), a Dutch research student came to Ireland to complete a project for university. On arrival Matthijs was shocked at the extent of commercial development on Irish peatlands and distressed that no thought was being spared for the conservation of some of these sites. So when Matthijs returned to The Netherlands he decided to take action for Irish bogs before time ran out. Matthijs set up the Dutch Foundation for the Conservation of Irish Bogs (Stichting Tot Behoud Van de Ierse Venen) and for three years campaigned tirelessly to raise enough funds to purchase three peatlands in Ireland. At the same time the Irish Peatland Conservation Council (IPCC) was set up to conserve a representative sample of peatlands and to act as a watchdog for Irish peatlands. By 1987 the Dutch Foundation had raised enough funds to purchase three peatlands in Ireland. These were: Scragh Bog, Co. Westmeath (above left); Clochar na gCon Bog in Co. Galway (above centre) and Cummeragh River Bog, Co. Kerry (above right). The Dutch Foundation then handed these sites over to the Irish Nation as a gift. Raising awareness was vital to the Dutch campaign. 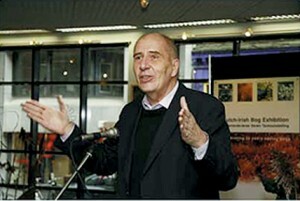 They organised a touring exhibition entitled De Venen Geturfd, published The Face of Ireland (an anthology of literature) and a supporters newsletter entitled Ierse Venen. In 1987 both the Dutch and Irish Governments signed a technical agreement for co-operation in the area of peatland management and restoration. 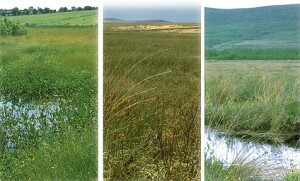 Raheenmore Bog and Clara Bog in County Offaly were the chosen study sites. 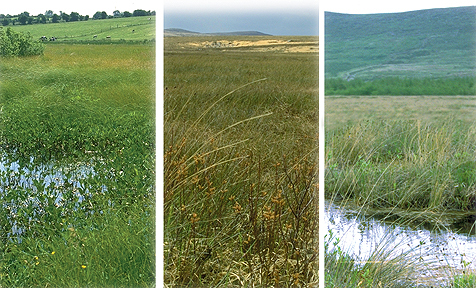 The insights gained were used in the Irish Raised Bog Restoration Programme (1994-2000) to identify raised bogs for designation as Special Areas of Conservation and in the planning of rehabilitation measures on sites in the two countries. A synthesis of the findings of the research programme have been published in the book Conservation and Restoration of Raised Bogs. Geological, Hydrological and Ecological Studies 2002, edited by Matthijs Schouten. Not only scientific researchers have been inspired by the peatlands of Ireland, for years people have been singing, dancing, painting, writing, sculpting and above all speaking in many different voices about bogs. 250,000ha of Irish peatlands designated for conserved. The IPCC has been the peatland watchdog for over 25 years and have campaigned tirelessly to ensure a future for Irish peatlands. National parks such as Glenveagh in Co. Donegal, Killarney in Co. Kerry and Owenduff in Co. Mayo have been opened to the public. Centres such as the Ceide Fields and the Bog of Allen Nature Centre educate visitors about the beauty of Irish peatlands. Until the 1980’s text books at schools in Ireland and The Netherlands suggested that peatlands had only one use: to serve as a source of fuel. IPCC’s education programmes and publications have changed this unbalanced view. Until 2015 Ireland had no National Peatland Strategy. Following the setting up of a stakeholder group called the Peatlands Council of which IPCC is member, a National Peatlands Strategy was developed and published in 2015. Over 30 years have past since the peatland connection between Ireland and the Netherlands was formed and today with both the Irish Peatland Conservation Council (IPCC) and the Stichting Tot Behoud Van de Ierse Venen still actively promoting the conservation of a representative sample of peatlands for future generations to enjoy our story continues. With funding support from the Stichting Tot Behoud Van de Ierse Venen two IPCC staff members travelled to the Bargerveen reserve in the Netherlands. They met with rangers from the Staatsbosbeheer, the government agency charged with the restoration of Bargerveen in the 1980’s. At Bargerveen in 1980 a small portion of less than 100ha of peatland habitat remained. To ensure its future a series of peat dams and later boulder clay dams where built to raise and restore water levels around the site. Rangers learned that to create ideal conditions for peatland habitat to thrive there should be no more than a 30cm change in height over 100 metres distance. Water level monitoring was started to record the progress on the site over the next 30 years. The diversity of species now using Bargerveen as a habitat was fantastic to witness – foxes, hares, frogs, butterflies, deer, dragonfly species, birds and many more were spotted during IPCC’s short visit. On an afternoon survey by rangers and volunteers of the Common Blue Butterfly, a staggering 25,000 butterflies were recorded. The site is now an amenity for the public with walking routes ranging from 1km to 7.5km and cycle paths connecting to a 17km route. Bargerveen has collaborated with other groups and today it is part of a cross border Naturpark with Germany known as Internationaler Naturpark Bourtanger moor-Bargerveen. Bargerveen continues to look to the future with the creation of buffer zones that will have potential to supply Bargerveen habitat, local agriculture and areas further South with water in times of shortages. By creating aquatic buffer zones it was interesting to learn how local families could benefit through paludiculture – a type of farming specific for wetlands, growing reeds that could be used for thatching or biomass for the production of energy. To engage with visitors a Veen Museum (Peat Museum) is open and and a variety of information points around the Naturpark Bourtanger were observed. From the left: Partially filled bog pool with Sphagnum moss, sheep grazing to maintain open habitat and an example of one of the information points in the International Naturpark designed using the traditional shape of turf houses. 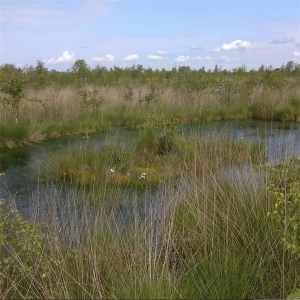 There are still challenges facing the peatlands of the Netherlands. IPCC staff learned how local farmers graze cattle and sheep to manage encroaching tree saplings. The invasive species of Japanese Knotweed introduced as a fodder for cattle was seen among native species and an emerging threat to the site was the volume of nitrogen deposition from industry that is affecting the growth of sensitive plants. Thanks to the partnership between the Netherlands and Ireland Irish peatlands are not in the same position as the Netherlands faced in the 1980’s but we can learn lessons from their experiences in restoration over the past 30 years so that into the future the Dutch and Irish bog story will continue. Management plans must be developed to restore conserved peatlands damaged by overgrazing and drainage. The National Peatlands Strategy for Ireland needs to be implemented and adequately funded. In addition to purchasing three bogs for conservation in Ireland, the Dutch Foundation set up a study fund to promote research into the conservation of Irish Bogs. The funds are to be used to cover costs of travel and accommodation up to a maximum of €2000. The Foundation are currently interested in receiving applications from interested bodies. The closing date for applications is 31st January each year with decision made after 1st April. Please follow the links provided below if you are interested in applying for aid. Become a supporter of the IPCC. Collect used stamps and forward them to the IPCC. Buy a symbolic share in an acre of Irish Peatland. Volunteer your time to help restore or clean up a peatland. Visit a National park or peatland exhibition centre to educate yourself on the issues affecting peatlands today. Be a watchdog in your area for any unwanted activity on conserved peatlands. Compost garden waste to make a rich compost instead of using peat in your garden. Save energy, 10-14% of our electricity is generated from milled peat.